It’s the end of January already and I managed to avoid posting anything for almost 2 months. Writing has been a bit hit and miss with family and other dramas, but if you follow my page on Facebook you’ll see I’ve been making progress! 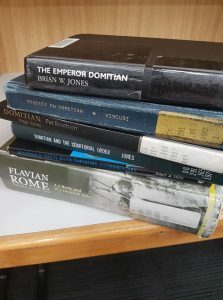 Research on the Emperor Domitian will give you all a clue as to the title character of the third Turning Points book, which will be available in the second half of this year. You can now purchase The Siege of Masada and Transylvanian Knight in EPUB and MOBI formats, as well as PDF, so no excuses for the e-book readers! The big event coming up next month is my talk at the Abbey Museum, Caboolture, featuring the history of Vlad the Impaler, the inspiration for my second book. You can buy tickets for this event here.